from those by Inland as the latter's safeties (bottom row) featured a beveled edge around the checkered pattern. These safeties have no manufacturer marks. On 10 Aug 1942 U.S. Ordnance approved elimination of the extra step that added the checkering as a time and cost savings. The safeties were left flat faced. late 1943 the holes were replaced by two V shape cuts with a ridge between the two that prevented the safety from moving from the fire or safe positions. the Model M2 in 1947 and all carbines in 1949.
rotary safety to prevent this from happening. The design was adopted 7 Mar 1945.
ordered the replacement of all push button safeties with the rotary safety on all carbine models. catch in place as the magazine catch spring pushed the catch outwards. The overall length when production started was 29/32", approx. .90" (top). Time and use altered the length slightly. 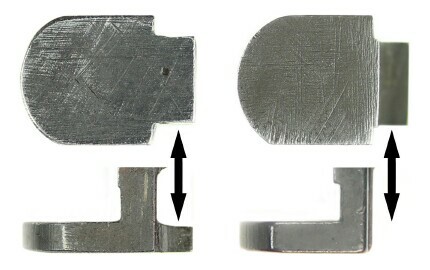 To strengthen the pressure exerted on the safety and magazine catch the overall length was increased to 31/32", approx. 1.0" (bottom). early as January 1944 and was used concurrent with the use of the shorter version. the longer version in conjunction with replacement of earlier magazine catches with the M marked magazine catch (Type III). The shorter version was replaced to the extent it has become far less commonly encountered than it's longer replacement. Used at the beginning of production this first Magazine Catch featured vertical serrated edges. On 10 Aug 1942 U.S. Ordnance approved skipping the step that produced the serrations to save time and cut costs. The serration was discontinued by late February or early March 1943.
the face was shortened by eliminating the overhang producing what is referred to as a "short face" (right). All magazines catches thereafter have the short face. by altering existing long face magazine catches with serrated edges as opposed being newly manufactured. the majority of smooth short face magazine catches were of new manufacture. and increase reliable movement the rail of the Type III Magazine Catch and all that followed was changed to .065"-.07". 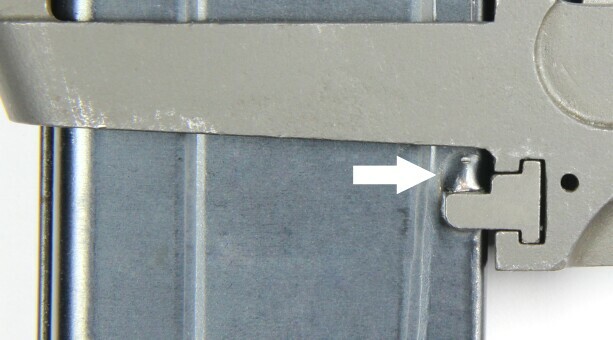 The letter M (Modified) was placed on the face of the magazine catches having the thinner rail to easily identify them from their predecessors. Company (for Inland) used a serif font (bottom). 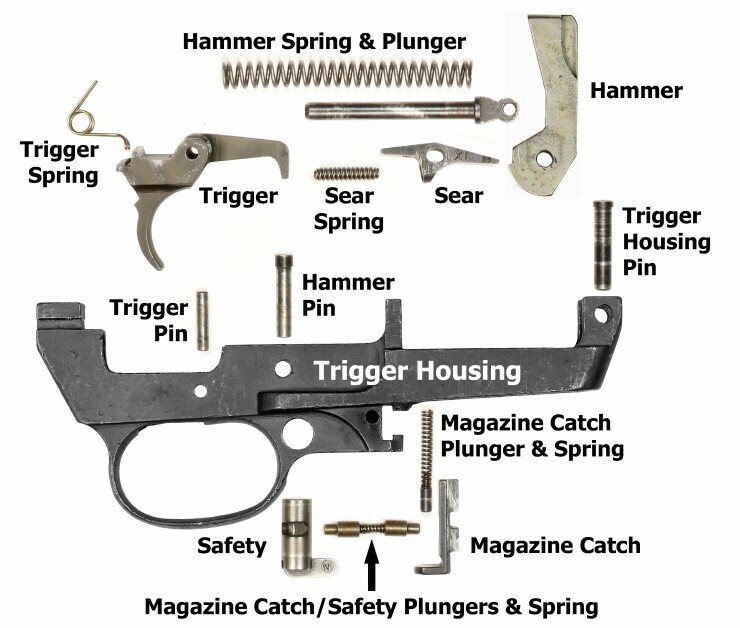 carbines to replace all prior magazine catches with the Type III and all shorter safety/magazine catch plungers and spring with the longer version. these needs. These included Type III mag catches manufactured by Walt Manufacturing Company and Commercial Controls (formerly National Postal Meter). testing in April 1945. The new magazine catch design was identified by underlining the M on the face of the magazine catch. The 30 round magazines included three nubs for holding the magazine in place. a 90 degree arm on the end of the mag catch facing the left side of the carbine. indicated the mag catch with the underlined M was currently being supplied with the Model M2 Carbines and was acceptable for use on all carbines. An Ordnance work order dated 29 Oct 1952 to their armorers servicing carbines identified an M2 mag catch absent the M as currently being supplied with the Model M2 Carbines. already been inspected. Many retained their type III mag catches. The Magazine Catch Plunger and Spring remained unchanged throughout production.